This news item was posted in L, Lung category and has 1 Comment so far. Lung diseases are conditions in which some function of the lung is adversely affected. In some cases, the problem is in the gas exchange process at the membrane between the alveoli and blood – impeding efficient uptake of oxygen and removal of carbon dioxide. In other cases, the problem is the inability of the bronchial system to effectively deliver air to the alveoli – possibly due to blockage of the branches of the bronchial tree or due to compromised ability of the chest muscles to expand and contract enough to move air through the bronchial tree to the alveoli. Sometimes the problem is the inability of the lung to remove or detoxify foreign substances – possibly because of an underlying deficiency or because the amount of these substances has overwhelmed the lungs’ defense systems. Asthma is a chronic lung disease characterized by inflammation of the bronchi and bronchioles, and episodes (attacks) of airway obstruction. People with asthma are sensitive to a variety of substances that do not cause the same reaction in other people. Episodes may be triggered by cigarette smoke and other particles in the air, dust, mold, allergens, exercise, cold air, and other factors. The triggers for each person may be different. During an attack, the lining of the airways swell and the muscles surrounding the bronchi contract, narrowing the airway. Mucus secretion can further inhibit the flow of air; making breathing difficult and causing the affected person to wheeze. Most episodes do not cause permanent lung damage but frequently require immediate medical attention since lack of oxygen and build-up of carbon dioxide can be life-threatening. According to the American Lung Association (ALA), asthma is the most common chronic disorder in childhood. It affects more than 6 million children in the United States and about 15 million adults. Chronic obstructive pulmonary disease (COPD) is a term used for both emphysema and chronic bronchitis. According to the ALA, COPD is the fourth leading cause of death in the United States. With chronic bronchitis, the bronchial tubes become inflamed and scarred. With emphysema, the air sacs in the lungs are slowly destroyed. With both disorders, patients experience increasing difficulty exhaling and getting a sufficient oxygen supply. 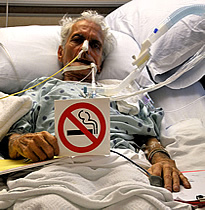 Smoking causes about 80 to 90 percent of the deaths associated with COPD. Other risk factors include repeated exposure to air pollution. * Repeated exposure to organic substances such as moldy hay, animal droppings, and grain dust can cause hypersensitivity pneumonitis and eventually lead to pulmonary fibrosis. Infections can occur primarily in the lungs, may affect the entire body, including the lungs, or may develop in the pleura, which are the membranes surrounding the lungs. They may be acute or chronic and be caused by bacteria, viruses, and more rarely, fungi. Pneumonia is an acute lung tissue inflammation caused by a variety of microorganisms. Influenza is an acute systemic illness caused by a virus that includes respiratory symptoms. Tuberculosis and nontuberculous mycobacteria (NTM) are chronic infections most commonly seen in patients with compromised immune systems (such as patients with HIV/AIDS). The infections caused by mycobacteria develop slowly and can be systemic or confined to the lungs. Lung cancer is the uncontrolled growth of malignant cells that in the lungs. There are two main types, small cell and non-small cell lung cancers. Other cancers may spread to the lungs but are considered metastatic because the cancer cells do not come from lung tissue. The number of lung cancer deaths has been rising in women in recent years and falling in men. According to the National Women’s Health Information Center, lung cancer is currently the leading cause of cancer death for American women, killing more women than ovarian, breast, and cervical cancer combined. Risks for lung cancer include smoking and exposure to radon. Pulmonary hypertension is a lung disorder characterized by a narrowing of the blood vessels in the lungs, increasing their blood pressure and causing the heart to work harder to transport blood into the lungs. This condition may co-exist and exacerbate a variety of lung diseases and can lead to heart failure. Pulmonary embolism is a blood clot that usually originates in the veins of the legs or pelvis and travels to the lungs where it blocks a blood vessel, causing chest pain, acute shortness of breath, and coughing. This condition can be life-threatening and requires prompt medical attention. Bronchopulmonary dysplasia (BPD) is a lung disease that develops primarily in premature infants that have undergone prolonged oxygen therapy and/or been on mechanical ventilation for extended periods of time, but may also be seen in those who have experienced oxygen toxicity or had pneumonia. With this disorder, airways are inflamed, do not develop normally, and may be damaged. Respiratory Distress Syndrome (RDS) of the newborn is a life-threatening breathing problem that may develop in infants born earlier than 6 weeks before their due date. These premature babies’ lungs are not developed enough to be able to produce a sufficient amount of the protective liquid substance called surfactant in the lungs. Without surfactant, the lungs are not able to expand or inflate properly and the babies have difficulty breathing in enough oxygen. It is a condition that may occur within a few hours after premature birth. Acute Respiratory Distress Syndrome (ARDS) is the rapid onset of severe breathing difficulties due to extensive lung inflammation and the lungs filling with fluid. It is a sometimes fatal condition that can be brought on by many types of injury to the lungs including serious viral or bacterial infection, sepsis, trauma, multiple transfusions, drug overdose, or inhalation of substances such as salt water or smoke. Cystic fibrosis is an inherited disease that affects the lungs, pancreas, and other body systems. It is characterized by salty sweat, the production of thick mucus that can obstruct breathing, and decreased ability to digest fats and proteins – leading to malabsorption and malnutrition. It is more common in Caucasians than other ethnic groups and is usually diagnosed in infancy. According to the ALA, about 1,000 new cases are diagnosed in the U.S. each year. Alpha-1 Antitrypsin deficiency is an inherited deficiency of a protein that provides protection to the lungs. Without this protection, the lungs become progressively damaged and the patient is at a significantly increased risk of developing early-onset emphysema and liver disease. The ALA estimates that about 100,000 Americans have this deficiency, and about 25 million are genetic carriers of the disease. Other disorders do not affect the lungs directly, but they impair a person’s ability to breathe properly. These extrinsic disorders may affect the chest cavity, muscles, nerves, and heart. They include a variety of conditions, such as neuromuscular diseases like muscular dystrophy, polio, myasthenia gravis, Guillain-Barré syndrome, and amyotrophic lateral sclerosis (ALS, or Lou Gehrig’s disease), and disorders that result in abnormal spine formation or rib cage movement, which can restrict lung expansion. Signs and symptoms associated with lung disease will vary from person to person and change over time. With chronic conditions, symptoms often emerge gradually and grow progressively worse. With acute conditions, symptoms may be mild to severe. Some may be life-threatening without prompt medical attention. While each disease will have its own characteristics, there are common signs and symptoms that are seen with many lung disorders. These include a persistent cough and dyspnea. People may wheeze, gasp, cough up blood or sputum, and may experience chest pain. Those with obstructive lung conditions such as COPD may have trouble exhaling – some describe it as “like trying to breathe through a straw.” Lack of oxygen may cause an affected person’s skin to have a bluish tint. Over time, oxygen deficiency may lead to clubbing in some people – an enlargement of the fingertips and abnormal fingernail growth. The goals with testing are to diagnose lung diseases, determine their causes where possible, and evaluate their severity. Many doctors will order blood gasses to evaluate oxygen and carbon dioxide levels, lung or pulmonary function tests (PFTs) to help diagnose and monitor lung function, and chest x-rays and or CT (computed tomography) scans to look at lung structure. Other testing is performed to help diagnose specific conditions. * Fetal Lung Maturity (FLM) tests – used to evaluate the lung maturity of a fetus and may include tests for lecithin/sphingomyelin (L/S) ratio, phosphatidylglycerol (PG), foam stability index (FSI), or lamellar body counts (LBC). May be used to determine age of gestation before cesarean delivery or when a preganant woman is having symptoms of premature labor. A few of the more common tests are listed below. For more complete information visit the website for John Hopkins Medicine: Pulmonary Function Laboratory. * Spirometry – measures the amount and rate of air exhalation as a patient blows out through a tube. It is performed to evaluate narrowed or obstructed airways. * Air flow with a Peak Flow Meter – measures the rate of exhalation. It can be used at home by patients with asthma to help monitor their condition. * Lung Volume – the quantity of air a person takes into their lungs and how much is left in the lungs after exhalation. Helps evaluate the elasticity of the lungs, the movement of the rib cage, and the strength of the muscles associated with respiration. * Diffusing Capacity Measurement – assesses the transfer of oxygen from the lung air sacs to the bloodstream by evaluating how much carbon monoxide is absorbed when a small quantity is inhaled (not enough to harm). The goals with lung disease treatment are to prevent the disease wherever possible, treat infections and prevent their spread to other people, reduce inflammation, stop or slow the progression of lung damage, relieve symptoms, ease breathing, minimize the side effects associated with some treatments, and make sure that the affected person is getting sufficient oxygen. Many cases of lung disease could be prevented by not smoking, testing for radon, minimizing exposure to particulates such as asbestos, coal, beryllium, silica, molds, grain dust, air pollution, and to chemicals and drugs known to affect the lungs. People with compromised immune systems, existing lung disease, and those who are very young or elderly should talk to their doctor about the advisability of getting annual flu shots and pneumococcal vaccines to minimize their risk of getting influenza and pneumonia. New therapies for lung diseases continue to be developed and patients’ treatment needs change over time. Patients should talk to their doctors periodically about the treatments that are right for them.